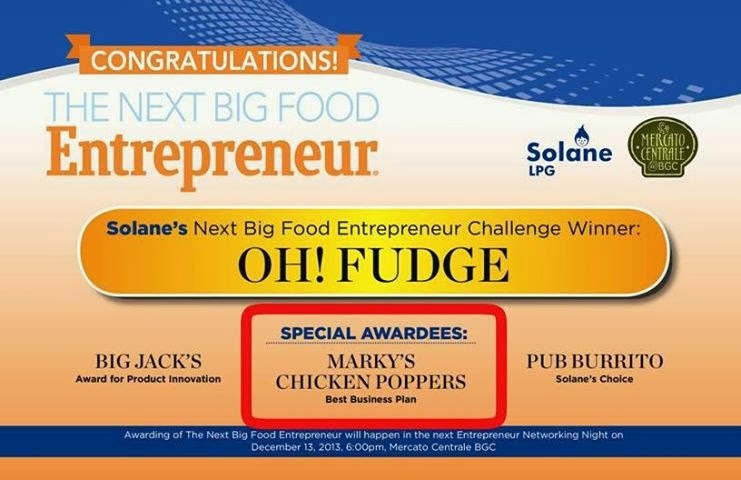 The Chic Mompreneur: Marky's Chicken Won!!! Three months ago, we entered in the Next Big Food Entrepreneur contest sponsored by Entrepreneur Philippines magazine and Solane. It was a gamble for us since it was our first time to join any kind of contest. After three rounds, we won an award! First round was the food tasting contest wherein more than 60 participants joined in the first leg. From that round, only 20 moved on to the next one. Second round was the selling round. The top 20 finalists got to sell their food innovations at any of the Mercato Group's markets. Third round was presentation of business plan. We were declared the most comprehensive business plan among the top 20 finalists! We are so happy! We never would have done any of this without God's guidance. Thank you Lord for being the best business partner! Philippine Airlines Flight for only Php1592?